Camping with family, Roopantara, Bangalore. ecoMUKTI Experience. Roopantara is not a luxury resort. The experience is designed to be natural, rustic and organic in simple yet comfortable facilities, wholesome food and wonderful community. Most of the food served is organically grown at Roopantara and picked fresh from the field. Nutritious, vegetarian meals are served. In keeping with the Roopantara philosophy, we do not allow the use of any kind of smoking, alcohol or drugs on campus. Roopantara offers a modest, rustic, space where families and friends can spend quality time together. Amita, Badi and their daughters Dia and Ciana hope everyone who visits Roopantara will feel it's their 'home away from home'. 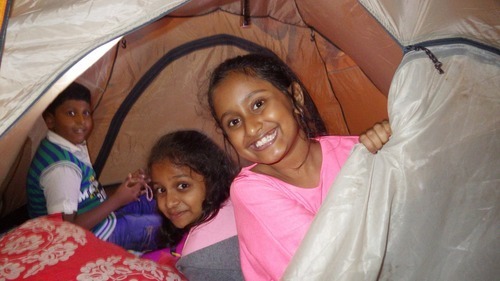 Amita and Badi are on a journey - to set up Roopantara - a Center for Learning. Their inspiration is their two daughters - their creativity, love for children, animals and nature and their thirst to learn, in an open and loving environment. Roopantara, literally “inner transformation” is a space for schooling and after-school; for weekend workshops, camps, for home schooling parents who would like to be a part of a short term program or project for their children and a space for day/weekend visits by schools, families and groups. Roopantara also heartily welcomes those who would like to come and conduct workshops and use this space in line with the vision of Roopantara.